Irish frog is a metal Christmas ornament with a dangling shamrock. This Irish ornament features a lucky frog who is enhanced with a dangling shamrock along with a leprechaun's hat. 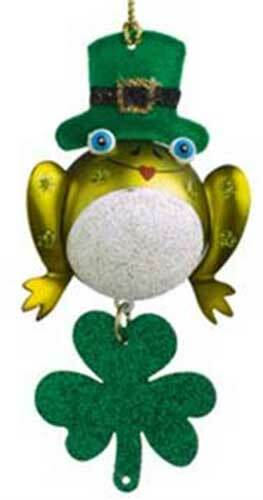 The colorful Irish frog ornament is a dimensional design that is made of metal; it measures 2" wide x 6" tall.